Do you want to know another reason I love May? Because Cinco de Mayo. Mexican food happens to be my absolute favorite type of food. And my favorite Mexican dessert? Tres Leches Cake of course! This recipe is perfection! The three milks saturate this cake so that each bite is filled with such incredible flavor and melt in your mouth goodness. I have been on the lookout for a delicious Tres Leches Cake and have tried my hand at quite a few of them… but none can compare to this one. It is seriously perfect. Everyone who tried it couldn’t stop raving about how yummy it was. I combined two recipes and the end result was fabulous, trust me on this one! With Cinco de Mayo in just 2 days, put this cake on the menu. Everyone will be thanking you because you did! Tres Leches Cake... Let me just say, this cake will knock your socks off! It is SO moist and delicious beyond words! This recipe is definitely a must try! Preheat oven to 350 degrees F. Grease and flour 9 inch round cake pan. In a medium bowl combine egg yolks with ¾ cup sugar and beat until light in color and doubled in volume. Add milk, vanilla, flour, and baking powder. Stir until well combined. In a small bowl beat egg whites until soft peaks form. Gradually add remaining ¼ cup sugar and continue beating until stiff peaks form. Gently fold egg whites into yolk mixture. Pour into prepared pan. Bake at 350 degrees F for 45 to 50 minutes or until cake springs back to the touch and the toothpick comes out clean. Using a knife, carefully loosen edges of cake from the pan. Invert cake onto a wire rack. Flip cake again so it cool right side up. Let cake cool for 15 minutes. In a small mixing bowl combine Tres Leches ingredients and whisk together. Using a fork, poke holes all over the top of the cake. Place cake on a rimmed dish and slowly pour tress leches mixture over the top of the cake letting it soak in as you go. Refrigerate for it least 1 hour. In small bowl whip cream until thickened. Fold in powdered sugar. 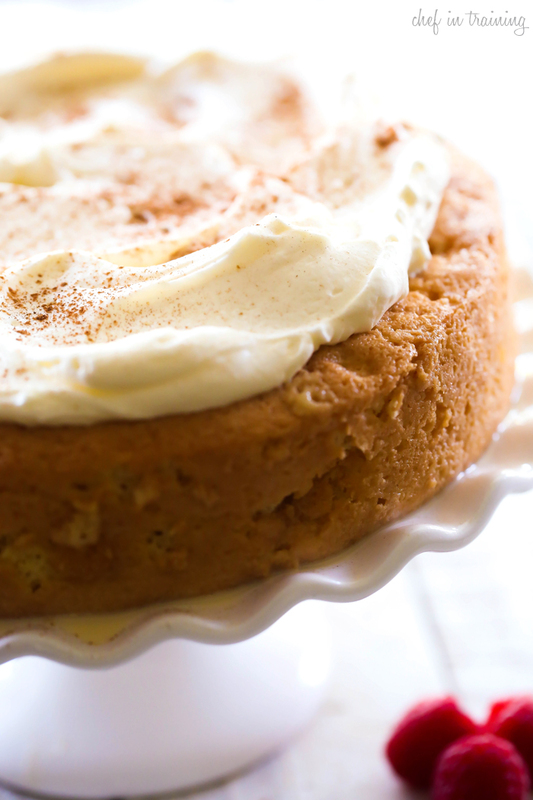 Spread whipping cream over cake and sprinkle with cinnamon. It does look like the perfect tres leches cake! I would love a huge piece...so soft and wonderful! Pinned! Happy Cinco de Mayo! I love how soft and moist that cake looks. I would really love to have a ginormous slice of it right now. Yum. Can this be double.? Or is it best to do single .. Have you ever stacked , as a 2 layer? Happy Birthday! This is a perfect cake for all the up coming celebrations—Cinco de Mayo, Mother's Day, birthdays. 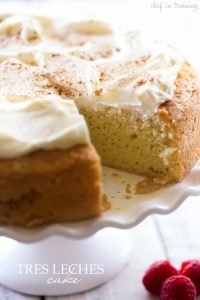 It looks moist and delicious and I love the whipped cream topping—light and with a slight hint of sweetness. We bought the Tres Leches cake from Costco for a Cinco de Mayo party at church, but I really didn't like them very much. Yours looks much better. I will have to give it a try! Baked this cake for Cinco de Mayo, along with beef enchiladas from 12 Tomatoes. The cake was soooo good! Came out beautifully and was full of flavor and sweetness. Thank you! Just baked my cake and I am not sure if it is quite right. I followed directions exactly but my cake puffed up a lot and seems much like angel food cake. Is this supposed to be how it bakes up? I went ahead and poked it, although difficult given that it was so spongy, and poured the milks on top. I think it will taste good but it's not very pretty. Lol!